I went to the Commission on Elections Office this morning to accompany a friend who is going to register as a voter for the first time. We arrived at around 10:15 in the morning bringing with him a valid Identification Card (ID) showing his present address and a photocopy of said ID. Since he is already 24 years old, he was not required to bring a birth certificate anymore. We spent exactly an hour for the registration. We started out by submitting a photocopy of the required ID and in return the staff gave my friend some forms to fill out. 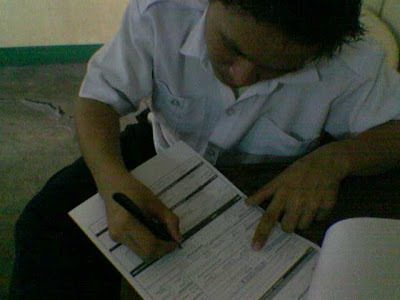 After filling out the form, we returned it to the staff and waited for his name to be called for verification of the details on the form. The last step was for his biometrics and his picture to be taken. 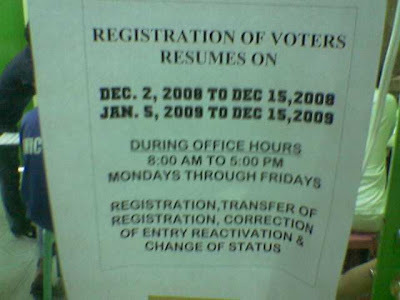 The registration started on December 2, 2008 and will end on December 15, 2008. But don't fret, that's just a Christmas break... they will be accepting registrations again starting January 5, 2009 until December 15, 2009. For registrants who are 18 years old and below, you must bring a copy of your birth certificate and one (1) valid Identification Card (showing your present address) with its photocopy. Birth certificates are not required for registrants aged 19 and above.